It seems everybody with a baseball-oriented blog at one point or another does some sort of prospect ranking. I've resisted the urge to compile my own list of Twins prospects, arguing to myself that I have little if anything to add to the discussion. I've seen very little of the players, I don't routinely talk to scouts or player development people. What I can do is make a decent evaluation of the numbers and form opinions from the stats and what I read and hear from other sources. Which is pretty much what I do on every topic in this blog anyway. The general consensus has Sano ahead of Buxton, because 1) Sano is slightly ahead of Buxton in the process and 2) Sano has top-of-the-line power, which is the most important tool. I'm going with Buxton because he has a much wider range of tools and because he's clearly capable of playing a premium defensive position. If I were convinced that Sano will make it as a third baseman, I'd join the crowd and put him at the top. Similarly, I would have Rosario higher if I were sure he'll be a major league second baseman. And if I were sure he won't be a second baseman, I'd likely put him behind Kepler. I don't know that Rosario's bat is going to be good enough to be a corner outfielder. You can make a case for putting Meyer, Gibson, Barrios and May in almost any order among the pitchers; the only thing I'm absolutely sure of is that Meyer has to rank above May. Barrios is the furthest from the majors, Gibson the closest; Gibson may have the lowest ceiling but the highest floor. I think there's pretty clear dividing line between No. 10 and No. 11. After Kepler, we have high draft picks who had difficult 2012s (Michael and Benson); pitchers who were relievers in college (Melotakis and Bard); and a likely No. 2 catcher (Herrmann) who's nearly ready. Expectations in all cases are somewhat dampened. I could have replaced any of those five with the likes of middle infielders Niko Goodrum, Jorge Polanco and Danny Santana or corner infielder Travis Harrison. But they have their own question marks. 'Tis the season of prospect lists, and MLB.com on Tuesday released its rankings of the Top 100 prospects. The Twins have six of the 100 players -- led by Miguel Sano at No. 12 and Byron Buxton at No. 19. Then they have Alex Meyer at 40, Kyle Gibson at 49, Oswaldo Arcia at 93 and Aaron Hicks at 98. I don't have a particularly high regard for the MLB rankings, at least as compared to those compiled by Baseball America or John Sickels, and the case of Hicks is a specific example. After the 2011 season, MLB.com had Hicks listed at No.24 -- a ranking that had to be fueled my his impressive athletic tools, not his performance. He had spent three years mired in A ball -- two seasons at low-A Beloit, one at high-A Fort Myers -- and had hit .242 in the Florida State League. At that point, BA and Sickels dropped Hicks from their top 100 lists (Sickels's actually two lists, 50 position prospects and 50 pitching prospects). Last season, bumped up to Double-A New Britain, Hicks blossomed. It was easily the most productive season of his minor league career, and it came against a higher level of competition than he had ever faced. He did more in 2012 to establish himself as a prime prospect than he had in the previous three years combined, and as a result he's the apparent favorite to claim the center field job in Minnesota. And for that, he dropped 74 spots in the MLB.com rankings. I suppose MLB.com should be credited with keeping Hicks high in its rankings last year despite his struggles in the lower levels of the minors. But I don't understand the logic of downgrading him when he shows signs of turning tools into skills. The Twins weren't the only major league team holding a promotional "fest" last weekend -- with the offweek in the NFL playoffs, it was a good opportunity to get some headlines and remind fans that spring training is just a couple of weeks away. Detroit: Perhaps the biggest question for the Tigers is: Who closes? Jim Leyland, the manager, had an amusing answer and a more sincere one, and the sincere one can be found in the link: Prospect Bruce Rondon is the leading candidate, but Leyland wants to get a sense of his makeup before committing to the kid in the ninth inning. But I liked this one, from the first day of Tigerfest: This is why I like these forums, so I can think about these things. I don't know what I'm going to do. Chicago: The ghost of A.J. Pierzynski, who signed with Texas as a free agent, apparently haunted Soxfest. That's understandable: Pierzynski has been a durable, productive catcher who fit well with the South Siders self-image, and nobody really knows what to expect of Tyler Flowers, the heir apparent. 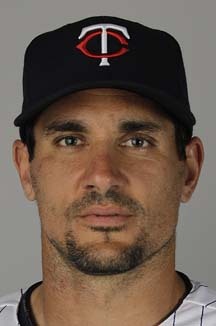 I understand why the Sox let A.J. go. He's in his mid-30s, and he has a lot of mileage on his tires. Catchers typically don't last as long as he has. But I expect the Sox will miss him a great deal. Kansas City: Actually held its fanfest the previous week. The Royals, who've been compiling a lineup of talented young position players, were rather aggressive about getting starting pitchers -- Jamie Shields, Jeremy Guthrie, Edwin Santana, Wade Davis -- and the organization obviously wants to make its move up the standings now. I have the sense that the K.C. fan base isn't fully buying it. Cleveland: Also held its Tribefest the previous week. Hey: Terry Francona! Nick Swisher! A couple of new names the casual fan knows! The offseason move that matters most was probably trading for pitching prospect Trevor Bauer, but that's not the kind of guy who packs the autograph lines. I'll say this up front: I'm not a football fan. (I volunteered to work during the Super Bowl, and the copy desk TV will be tuned to the Puppy Bowl.) I am, obviously, a baseball fan. And I dislike, from a public policy standpoint, the public financing component for the coming Vikings stadium. So it's not surprising that in the brewing fight between the Vikings and amateur baseball over the dimensions of the new "Taj Ma Zigi" (thank you, Patrick Reusse), I'm on the baseball guys' side. I understand the Vikings argument that they're competing with HDTV. I've been to a few NFL games. They've been well spaced apart, because it takes about a decade for me to forget how miserable I find the experience of actually attending a NFL game. There's no question in my mind — if I cared enough about football to want to watch it regularly, it's far better to do so at home. And if the Vikings were paying for the new arena themselves, fine; they pay for it, they can set the rules. They aren't. The public financing for this facility — sold to the state by Gov. Mark Dayton as a "people's stadium" — dwarfs the entire cost of Target Field. True, this one has a roof, and Target Field does not, and that's bound to add to the expense. As I see it, the justification for the roof is the non-football uses the facility is expected to bear, and the extra costs of the enclosing the stadium is the justification for the state money. And now the Vikings are clearly out to undermine the non-football purposes. I doubt the Vikings' good faith in this. The "people's stadium" idea wasn't theirs; they just accepted it as a means to get the stadium. Once they have it, their goal will be to get everybody else out. Especially those pesky college, high school and amateur baseball teams. Bugs Raymond was an outstanding spitball pitcher about a century ago. He was also badly alcoholic — teammate Rube Marquard said Raymond didn't spit on the ball, he merely breathed on it and the ball got drunk — and he died at age 30. A waiter in one of Raymond's favorite taverns asked him how he threw his famous spitball. The pitcher picked up a glass tumbler as if it were a ball, demonstrated the grip, explained how he wetted two fingers, then wound up and fired the tumbler through the establishment's plate glass window. "Notice," the pitcher said as he sat down, "the break." I forgot to mention Carl Pavano in Thursday's post about ex-Twins of recent vintage who have found little demand for their services this winter. On Thursday came word that Pavano suffered a ruptured spleen while snow shoveling in Vermont. He remains unsigned, and with this injury, he's likely to remain unsigned into the season. In a long story on international signings in their Feb. 5 issue, Baseball America notes that the Twins have invested $150,000 in Johan Quezada, an 18-year-old right-handed pitcher from the Dominican Republic. Quezada, says the magazine's Ben Badler, is most notable for his projection: He's 6-foot-6 and 190 pounds. He throws now in the upper 80s, but if/as he gains weight and strength, that may well rise. He's definitely a project. 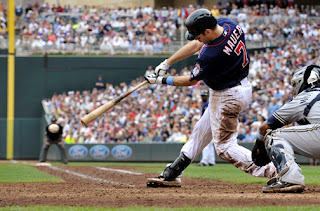 *General manager Terry Ryan told the AP's Jon Krawczynski the Twins aim to have Joe Mauer catch 120 games this year. He caught 74 last season (started 72), a workload that had many viewing him as transitioning out from catcher. It should be noted, however, that Mauer has only once started at least 120 games behind the plate (2008) and only one other time (2006) has he appeared in 120 games behind the plate (119 starts and one relief appearance). I'd love to see Mauer a truly regular catcher again, but I'll believe 120 games for him back there when I see it. *Miguel Sano has apparently grown an inch since his last official measurement and will be listed this year as 6-foot-4. His increasing bulk is a big reason for the doubts that he can play third base in the majors when his time comes. 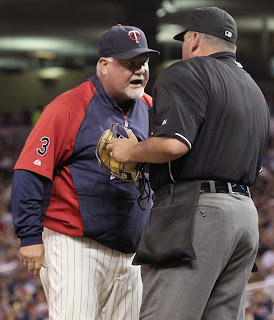 When I started this occasional series early this month, I listed six topics -- six areas of need for the Twins that one might reasonably use to gauge the effectiveness of Ron Gardenhire as manager in 2013. 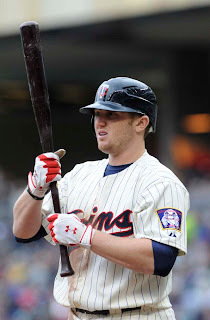 Today I'm adding one that should have come to mind with the original post: Establishing Chris Parmelee. Parmelee, Minnesota's first-round draft pick in 2006, will hit training camp next month as the presumptive starting right fielder. His best position is probably first base, but he's played considerable outfield as he toured the Twins minor league system. He'll turn 25 during training camp, and it's time to find out what he can do with sustained playing time. Right field is almost certainly not his long-term position. Oswaldo Arcia, a higher-end outfield prospect, is rocketing up the ladder; he is quite likely to lay claim to an outfield corner job by 2014. Veteran first baseman (and franchise icon) Justin Morneau is entering the last year of his contract; Parmelee could be shifted to first if the organization decides to cut ties with the 2006 MVP. But before making any such decisions, the Twins need to determine what they have in Parmelee. A year ago, the outside prospects gurus figured Parmelee was at best a platoon player or a "second-division" regular. But that was before he ripped Triple A at a .338/.457/.645 pace in 2012. His numbers in repeated call-ups weren't nearly so impressive, but they came with sporadic playing time. That shouldn't be an issue in 2013. With two of last year's regular outfielders traded away, there should be plenty of at-bats available for Parmelee. 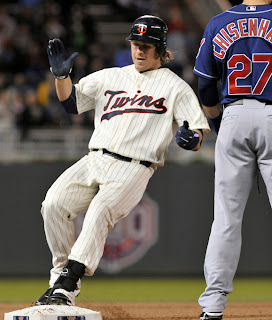 And the Twins have reason to invest those at-bats in him, even if the outfield defense, with Josh Willingham in left and Parmelee in right, figures to be severely weakened as a result. 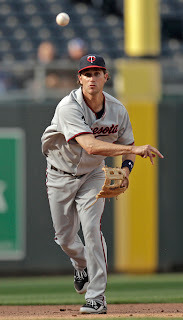 The Twins need to give Parmelee a chance to hit if they are to make the right choice on Morneau's future. Spring training is less than a month away, and an impressive number of former Twins are either still trying to find teams or have just landed jobs (or, in some cases, opportunities for jobs). The market is slim for players who had a big role in turning the Twins from a 90-plus win team to a 90-plus loss team, it would appear. 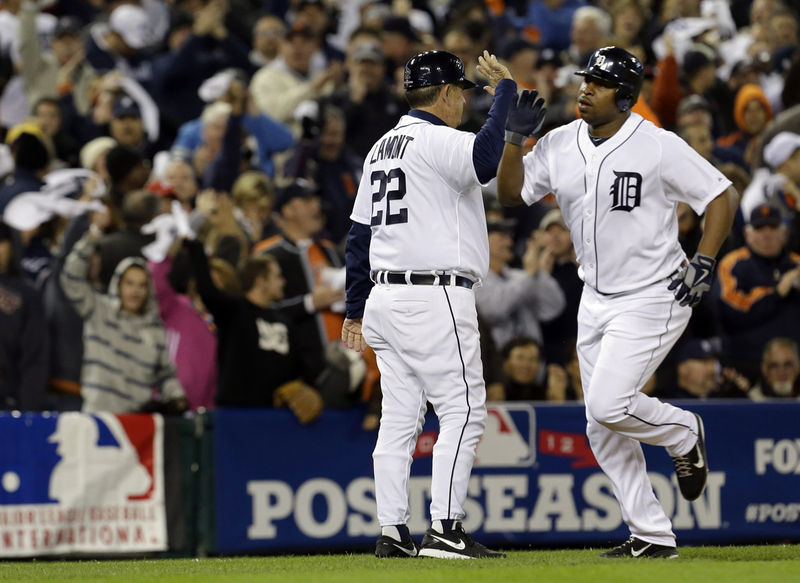 Delmon Young is only 27, but the promise has tarnished. Delmon Young, last seen bopping postseason homers for Detroit, was nevertheless quickly cut loose by the Tigers. He signed Tuesday with Philadelphia for a piddling (in baseball terms) $750,000 plus more than $2 million in bonus clauses, some of which are apparently tied to making weight at six different weigh-ins over the course of the season. It always amazes me when a major-league athlete in any sport has weight problems. It was one thing back in the day when players worked offseason jobs to make ends meet; today, when being a jock is a full-time, year-round job, getting out of shape to the extent that Young appeared to be last season signals a significant lack of self-discipline and/or interest in his job. And he's paying for it. The guaranteed money is a mere $50,000 more than Drew Butera signed for. That speaks volumes to how little interest there was in Young. The Phillies intend him to be their regular right fielder, but the contract structure suggests that he'd do well to avoid his usual lousy start. The Phils don't have a whole lot committed to him. 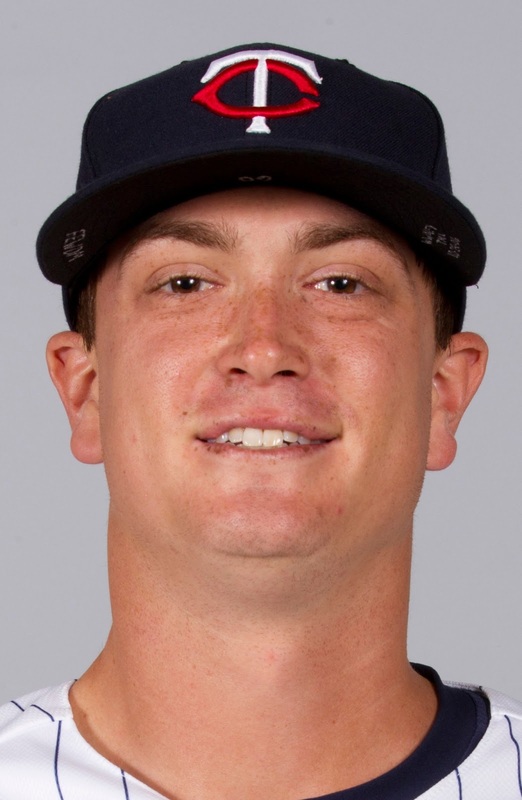 Kevin Slowey, last seen going on a minor league disabled list in the Indians organization and never returning, signed a minor-league deal Wednesday with Miami. The Marlins have lots of openings, but Slowey hasn't pitched much, or effectively, the past two years. The bridges between the Twins and Slowey were well and truly burned in 2011, but I'd still rather have him than Kevin Correia — which speaks less to my diminishing faith in Slowey's ability to pitch than to my conviction that the Correia signing will be a disaster. Francisco Liriano's deal with Pittsburgh finally became official this week, long after it was reported. The lefthander apparently fractured his right arm in a bathroom fall, and the two sides had to rework the deal to give the Pirates some protection should that injury for some reason be an issue. It shouldn't. The issue, as always with Liriano, will be throwing strikes. It doesn't matter what time dinner is when you're the steak. Frequent readers know I believe in the predictive power of two pitchers stats: strikeout-to-walk ratio and strikeouts per nine innings. Pitchers who are subpar in either of those markers might be successful for a year or two, but they are extremely poor bets to maintain that success. There are certainly commenters on this blog who dispute that; to be blunt, they don't know what they're talking about. And having said that, Earl Weaver — whose historical reputation is based in large part on his ability to get big seasons from his starting pitchers — always had below-average strikeout pitchers. Before I talk about the specific numbers for Weaver's moundsmen, I should note the drastic difference between his era and today. In 1979 — when Weaver won his fourth and final American League pennant — AL pitchers averaged 3.3 walks and 4.5 strikeouts per nine innings (that last the lowest K rate since 1955). That's a K/BB ratio of 1.36, which was also worse than a typical season, but not markedly out of line ( it was 1.39 in 1978, 1.44 in 1980). In 2012 — no doubt because teams are increasingly focused on pitchers who can miss bats — the K/9 rate was 7.4 — a full half-strikeout higher than in any previous season. The past seven seasons have have the seven highest strikeout rates in AL history. And the walk rate is at historically low (post-deadball era) levels as well, 3.0 BB/9. The combination leads to a 2.45 K/BB ratio, the highest in league history. As Chris Jaffe notes in this fine Hardball Times piece on Weaver, only the Royals and Brewers struck out fewer opponents in 1969-82, the core of Weaver's career. How did he get away with it? Defense. Jaffe points to some defensive metrics that suggest the 1973 Orioles were the greatest defensive team ever, and the '69 Birds were the next best. Regardless of how accurate the metric is, Weaver certainly put a premium on glove work — men like Mark Belanger and Rich Dauer lasted a long time with him despite a lack of offensive production. It's also worth noting that the low strikeout rates of the Orioles didn't stand out as much then as they would now. Combine those same strikeout rates with less than stellar defense in today's era, and you get the 2012 Twins pitching staff. a piece of their minds in 1979. 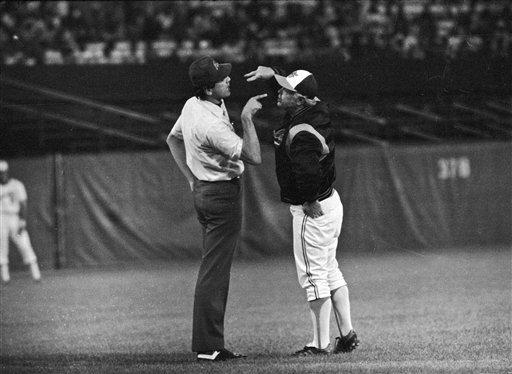 Earl Weaver was one of the great managers ever. But you probably already knew that. I was intrigued during the past weekend by the reaction to the news Saturday of his death. Weaver was eulogized not only by old-school writers such as Pat Reusse but by a generation of bloggers who hadn't picked up on baseball (or perhaps even been born) when Weaver left the Orioles dugout for the last time in 1986. The belligerent bantam's philosophies on how to run a game were expounded in the book "Weaver on Strategy," co-written by Terry Pluto. They were given mathematical support by Bill James in his seminal series of "Baseball Abstracts" in the 1980s. And thus Weaver is viewed, with some justification, as a precursor to the sabermetrically-oriented skippers of today. Many of Weaver's ideas about offense have indeed taken root as conventional wisdom. No manager today employs the stolen base, the hit-and-run or the sacrifice bunt to the degree that some of Weaver's contemporaries did in the 1970s. His precept -- If you play for one run, that's all you'll get -- is pretty much universally accepted. His appreciation for the walk as an offensive weapon is no longer unique. On the other hand, baseball has rejected the Weaver approach to handling a pitching staff. Weaver was an outspoken advocate of the four-man rotation (It's easier to find four starters than five; the starts you give your fifth-best pitcher come from the four who are better than him). Nobody uses the four-man rotation now; most managers won't even use their off days to maximize their ace's starts. Weaver's side appears to have lost that argument. And it also appears to have lost the platooning argument as well. Today's 12- and 13-men pitching staffs have pushed platoons to the endangered list; not only is it difficult for a manager to fit a platoon on a roster when more than half the roster is pitchers, but the ability of opposing managers to attack platoons with waves of relief pitchers tends to remove the advantage. Weaver at least once said something along of the lines of "Seven pitchers are too many, and 11 are not enough." What he meant was: If his staff was doing well, all he needed were four starters and a pair of relievers, but if the rotation provides a string of short starts, the bullpen is bound to be overworked. Today's managers lean to the "11 aren't enough" side of the equation. Weaver never went with just seven pitchers, but he sure wasn't carrying 11 pitchers, much less 12 or 13. There's another aspect to Weaver's managerial approach that deserves comment, but I'll tackle that in a future post. "How good was Stan Musial? Good enough to take your breath away." But it's not surprising that Musial's memory faded over the decades since he left the playing field. Musial, Bill James once wrote, "was never colorful, never much of an interview. He makes a better statue." There is now a consensus that Ted Williams, Musial's contemporary, was the greater player. Williams' superiority wasn't obvious at the time, and I don't think it's true. As I see it, there are four contenders for the title of "greatest left fielder ever" -- granting that outfielders play left field because they lack the arm or speed to play center or right. Those four are Williams, Musial, Barry Bonds and Rickey Henderson. You can argue for any of them and I won't criticize you. But given my choice, I'll take Musial. I'll certainly take Musial over Williams in the field, on the bases and in the clubhouse -- and while Williams was the greater hitter, Musial could hit too. To be sure, labeling Musial a left fielder is a bit dicey. 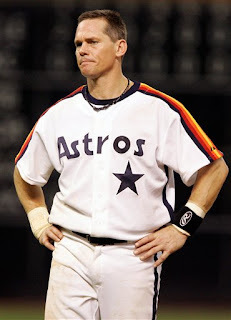 He started, according to his Baseball Reference page, 989 games at first base in his 22-year major league career, 868 games in left, 680 in right and even 305 in center. For some reason, probably that he was a left fielder during the run of World Series appearances he made with the Cardinals in the 1940s, he's remembered more as a left fielder than a first baseman. That BR page is quite the sight to behold, by the way. Every year seems to be the same -- 30 to 50 doubles, 10 to 20 triples, 20 to 30 homers, .330 averages or higher. And never as many as 50 strikeouts. So consistent, so durable, so dependable. No color, no flash -- just line drives in the gaps, and the sprint for the extra base. Joe Posnanski's remembrance: "(T)hat's how Stan Musial became known as 'Stan the Man.' After that, all he had to do was spend the next 67 or so years living up to the name." Rick Hummel of the St. Louis Post-Dispatch: "Musial became a Cardinal in 1941 and always was a Cardinal. In many ways, he was the Cardinals." 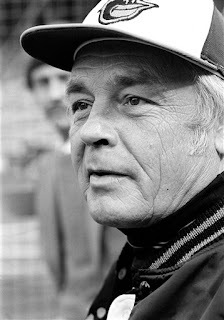 Earl Weaver, who managed the Baltimore Orioles for a sterling 14-plus years in the formative days of my baseball fanhood, died Friday night. He was 82. I expect to write a longer post about the Earl of Baltimore and how his influence is still felt in baseball some 25 years after he left the dugout, but today's joke day. Pat Kelly (who began his career with the Twins) was one of Weaver's platoon outfielders in the late 1970s. He had also become an evangelistic Christian and started a clubhouse chapel while with the Orioles. Weaver was not impressed. "Don't you want to walk with the Lord?" Kelly asked his often profane skipper. "I'd rather you walked with the (bleeping) bases loaded," Weaver replied. One of the frequently touched themes in the publicity tour that is the Twins Caravan -- or at least in manager Ron Gardenhire's portion of it -- is the vacancy in center field. Reading between the lines of multiple stories, Gardy really wants Aaron Hicks to take the job this spring, and has been of that mind even as the trade talks that resulted in the departures of Denard Span and Ben Revere were going on. Which makes sense, because, as noted here in the "Benchmarks" series, Hicks profiles not only as a legitimate defensive center fielder but -- unlike fellow center field candidates Darin Mastroianni and Joe Benson -- as a legitimate leadoff hitter. He's the destination. Gardenhire said he has received assurances from General Manager Terry Ryan that he can bring Hicks, the 2008 first-round draft pick who hasn't played above Class AA, north with the club if he earns the job this spring. Sounds obvious, right? If Hicks is the best option for a vacant job, he should have it, right? Seems hardly worth mentioning. Well, there are reasons Gardenhire finds such "assurances" worth mentioning. There are service-time aspects, such as arbitration eligibility, that make it financially desirable to delay a prospect's arrival in the majors. Plus the Twins have a well-established pattern over the past decade or so of handling promotions conservatively. The core philosophy seems to be: Better to call him up a month late than a month early. Hicks may be the best fit for the open job in April. It may well be that it is better for the organization, in the longer term, to delay his arrival for weeks or even months. It will be interesting to see what Gardenhire says for public consumption about this competition during camp -- and to see what actually happens when the Opening Day roster is set. The provisional rosters for the World Baseball Classic were announced Thursday. There's no shortage of Twins connections to various teams. Joe Mauer and Glen Perkins are on Team USA's roster, Justin Morneau on Canada, Drew Butera on Italy (really) ... at least six players on Australia's roster have been in the Twins system at one point or another. I'm rather torn on the WBC. There's something about national teams that appeals to me. The only soccer I can sit and watch is World Cup. For all its flaws -- and it is tremendously flawed -- the WBC is as close as we're ever likely to get to that kind of tournament of nations in baseball. But it's not close to major league baseball. Not close. Too many of the best players either don't want to play in the WBC (Buster Posey and Justin Verlander, to name just two) or aren't permitted to because of injury-protection rules (Scott Diamond, for example, was ruled out for Canada because he had his elbow scoped during the winter; Johan Santana can't pitch for Venezuela because he ended last season on the disabled list). This is the WBC's core problem: It's secondary to the regular season, to the real business of professional baseball. It's being held in spring training because nobody wants to interrupt the regular season for it. The early March schedule carries problems of its own, notably the question of athletic readiness for competition, but it is the least objectionable. Soccer halts itself for the World Cup. The NBA and NHL have, at least grudgingly, accommodated the Olympics. Baseball wants to have an international platform of that ilk, but it's not going to build that platform unless the WBC gets an elevated priority. There's been no shortage of posts here over the past two years on Trevor Plouffe, and one thing that jumps out at me as I review them is how little I seem to understand what the Twins are doing with him. They tried to find a shortstop in him long after I expected them to have given up on that task. They pulled the plug on him as an outfielder far sooner than I anticipated. Plouffe comes into camp next month still the third baseman-designate, but Terry Ryan has talked all winter about finding somebody to challenge that status. Ryan certainly didn't import a recognizable veteran name to do so, but he did bring in Mark Sobolewski, who has been kicking around the Toronto organization about as long as Plouffe's been in the Twins system. Like Plouffe, Sobolewski profiles at the plate as a low-average, low-OPB hitter with some power. Unlike Plouffe, Sobolewski hasn't reached the majors, and he's never had the home-run breakout Plouffe had last summer. Also unlike Plouffe, who struggled mightily defensively at third base, Sobolewski is said to have some chops in the field. Still, this is Plouffe's job. He hit 24 homers in his rollercoaster 2012, most of them in a torrid six-week midsummer span that bore no resemblance to his minor league record. If Plouffe is truly a significant power hitter, Sobolewski's not taking the job, and Plouffe will get a long opportunity to develop some defensive skills at the hot corner. It's really up to Plouffe. It's unfair to expect him to slug .750-plus, as he did during that hot stretch in 2012 -- nobody's that good. If he hits as he did for the entire season (,235/.301/.455), he'll probably need to sharpen the glovework to keep the job. Miguel Cabrera can be a butcher at third because he hits like few others. Plouffe isn't going to hit like that. If Plouffe can't hold the job, the options on hand aren't appealing. Sobolewski (and, for that matter, Deibinson Romero, another nonroster invitee who plays third) aren't likely long-term solutions at third base. For that one has to reach down to A ball and Miguel Sano, and Sano is no lock to remain at third base either. 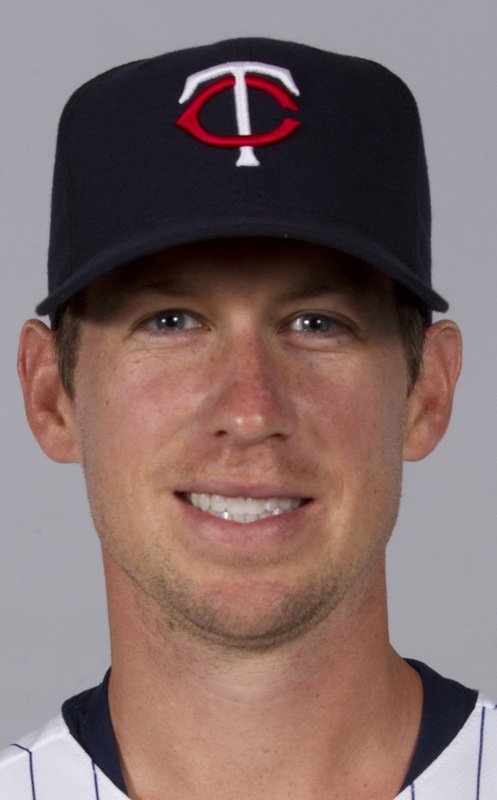 Nick Blackburn -- he of the $5.5 million 2013 contract and the 7.39 2012 ERA -- is to have surgery today on his right wrist. He'll then wear a cast for six weeks, which means it should come off about the time the exhibition games begin. This makes two surgeries on his pitching arm this offseason and, I believe, four since he got his ridiculous multi-year contract after the 2009 season. Ridiculous not because $14 million over four seasons is crippling in the context of the Twins payroll structure during that period, but because anybody who understands anything about the predictive role of strikeout rates could see the ineffectiveness and the injuries coming. The Twins seem resistant to this lesson, and so have committed another $14 million or so to Kevin Correia and Mike Pelfrey -- two more low-strikeout veteran righthanders -- over the next two seasons. Just stack the money in a big pile and burn it. Anyway, this new setback for Blackburn suggests that he's unlikely to regain his rotation spot to open the season. He should always have been a very long shot to do so, but the Twins would doubtless like to get something for their money, and he has had a history of compiling impressive ERAs in the Grapefruit League. He might have pried open a place for himself. Despite the cold snap, winter's time IS passing. One of the signs is that the Twins Caravan has begun -- two weeks of team representatives wandering Minnesota and neighboring states drumming up interest in the summer game (and exposing young players, many of them from milder climes, to the frozen North). This activity is capped off by Twins Fest, and then comes the migration to Fort Myers and spring training, now officially less than a month away. Day One of the Caravan ended in Mankato. As usual, I was trapped in the office and couldn't go; Jim Rueda, the Free Press sports editor, handled the coverage. The Caravan is rooted, of course, in promoting ticket sales and interest in the team. I would think that's a bit tougher this winter than it has been in a while. After almost a decade as the top team in the AL Central, the Twins have lost 195 games the past two seasons, and expecting a rapid turnaround seems unrealistic. So the organization is trying to peddle hope while avoiding promises it can't keep. in the Twins batting order. The Twins at this point have three vacant defensive positions: Center field, second base and shortstop. They also have significant vacancies at the top of the batting order, having traded Denard Span and Ben Revere. Figure that these six men are, barring injury, essentially set for regular play: Joe Mauer (catcher); Justin Morneau (first base), Trevor Plouffe (third base), Josh Willingham (left field), Chris Parmelee (right field) and Ryan Doumit (designated hitter). Other than Mauer, who led the American League in on-base percentage last year, those guys are better at finishing rallies than starting them. Their offense is more slugging percentage than OBP. And they're all pretty slow. There's not a prototype leadoff hitter in the pack. And, as we've seen in the center field and middle infield segments of this series, the candidates for those open slots aren't necessarily suited to be table-setters. Ron Gardenhire's batting orders have been frequently criticized. I don't often join in that criticism because I believe that the batting order is less important than having the right nine guys in the order. The inning with the most runs scored is the first inning, which makes sense because that's how lineups are generally built; the inning with the least is the second inning, because traditional lineups put weaker hitters at the end of the lineup. And if you average the first and second innings, it comes out even with the other innings. But ... if two of the winners of the open positions wind up hitting first and second full-time with well-below offense, that's a problem. Each lineup slot gets about 20 more plate appearances, over the course of the season, than the next one; having a guy who should be hitting eight or ninth hitting first or second is giving up a lot of outs. And if the winners of the three open slots are Darin Mastroianni, Brian Dozier and Pedro Florimon -- hardly unlikely -- that's three guys who probably ought to be hitting eighth and ninth. They can't all hit there. There's good reason to hit Mauer third, but there are other hitters capable of filling that role. There's nobody close to Mauer in terms of handling a table-setter role. He's not particularly fast, but that's a secondary concern compared to his .400 on-base percentage. So put Mauer in the two-hole. The shortstop, presumably either Florimon or Eduardo Escobar, should hit ninth. That leaves the leadoff slot and the eighth spot for the center fielder and second base. This isn't optimal, but it's better than putting two below-average hitters in the slots that get the most at-bats. Eventually, Aaron Hicks is supposed not only take over center field but the leadoff spot. Even if he wins the center field job this spring, however, it will probably behoove the Twins to ease him into a key offensive role. Brian Dozier theoretically might be able to fill a top-of-the-lineup slot, but he didn't hit well enough as a rookie to count on him doing so. Jamey Carroll is acceptable, but he's not a multi-year solution. Nobody else in the field of contenders for center field, shortstop or second base profiles as leadoff or No. 2 hitter. A realistic goal for Gardenhire this year is developing one top-of-the-order guy. Two would be ideal — two of them would let Mauer, the team's best hitter, hit third — but the raw materials may not be there. Dizzy Dean was used as a pinch runner in Game Four of the 1934 World Series. That's a move one doesn't see very often -- a pitcher, much less the staff ace, pinch-running -- and what happened to Dean is probably part of the reason. A Cardinal batter hit a likely double-play grounder; Dean went into second base standing up in an attempt to break up the double play; and the relay throw from the pivot man hit Dean right in the forehead. Dizzy's brother, Paul Dean (19 wins that season himself) assured reporters his beloved older brother was fine: "He was talking all the way to the hospital." "What did he say?" inquired a reporter. "Oh, he wasn't sayin' nothing. He was jus' talkin'." The Twins will have more than 70 players in camp next month -- the 40 on the major-league roster plus 34 (at this point) non-roster invitees. Add in the manager and coaches and subtract the eight retired numbers, and there are going to be a lot of high jersey numbers running around the complex in Fort Myers, Fla. The rule of thumb is: Returning jersey wearers retain their number unless they want to switch. Newcomers to the 40 get dibs on what's available. Nonroster guys who have had major league time can keep the number if it's still available. The others are just happy to have a number. * Ryan Doumit, who wore 18 last year, was reported by LaVelle Neal to have asked for No. 9, which was opened by the dismissal of coach Steve Liddle. When I read that, I figured that Doumit had worn 9 while at Pittsburgh. But no, he wore 41. No idea why he wants 9. * Vance Worley, a pitcher acquirred from Philadelphia in the Ben Revere trade, wore 49 with the Phillies, and 49 is available. (That was worn in recent seasons by Jeff Manship, who is no longer in the organization.) That number is in the range that usually goes to a pitcher, so I expect Worley to be 49. * Twins fans of advancing age know that Tom Brunansky was No. 24 as a player with the Twins in the 1980s. Trevor Plouffe has 24 now. I doubt Bruno's history will trump Plouffe's squatter's rights to the number. Bruno wore 23 with the Cardinals and Red Sox and 18 with the Brewers. Chris Herrmann is 23 now, and 18 is, as noted, apparently open. Or perhaps Bruno will migrate to a number in the low-to-mid 40s with most of the coaching staff; 43 and 47 are open. *Terry Steinbach wore 36 his entire career, and it's probably available (worn last season by Clete Thomas, who's still around but not on the 40). I'd be surprised if Steinbach's not wearing 36. * No. 4 hasn't been issued since Paul Molitor rejoined the organization, and even with the number squeeze, I don't think it will be used this year either -- unless Ron Gardenhire is fired in midseason and Molly inherits the job. * As a general rule, the higher the number the less chance a player has. In that light, it will be interesting to see who gets some prime digits. Open at this point: 1, 2, 11, 12, 13, 18, 22, 30 and 32. Plus, 17, 21 and 26 are currently held by non-roster guys (Lester Oliveros, Sam Deduno and Brian Dinkelman, respectively; I don't know if they'll even issue a number to Oliveros.) If I had to pick a number to assign to a young player, it would be No. 11 for Aaron Hicks. * P.J. Walters and Anthony Slama each wore 39 in their previous tenures with the Twins. Neither is on the 40-man roster; both are invitees. Which gets the number -- or will it go elsewhere rather than imply that the one who gets it ranks above the other in the pecking order? *Josh Roenicke is an interesting puzzle. He's been with three teams and worn six different numbers (indicative of how fragile his status has been). Last year, his best season, he wore 30, and that's been vacated by Scott Baker. If he's superstitious, Roenicke might wish to stick with 30. *Kevin Correia's worn 29 for the past four seasons, but that's retired in Minnesota (Rod Carew). He'll need a change. * Mike Pelfrey wore 34 with the Mets, but that's retired in Minnesota (Kirby Puckett). He'll need a change. * Rich Harden's spent most of his career wearing No. 40, which belongs here to Rick Anderson. He's also worn 16 (Josh Willingham) and 18. No idea where he's going. last season, but didn't shine in the field or at the plate. The Twins have truly lacked stability in the middle infield for much of Ron Gardenhire's tenure. 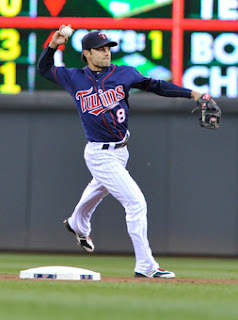 Since the breakup of the League of Nations infield he inherited from Tom Kelly (Doug Mientkiewicz, Luis Rivas, Corey Koskie and Cristian Guzman) after the 2004 season, the Twins have had just two three 100-start seasons in the middle infield: Luis Castillo in 2006 at second base, Jason Bartlett in 2007 at shortstop, Orlando Hudson in 2010 at second base. Eight seasons of patchwork in the middle infield. 2013 is likely to be more of the same. 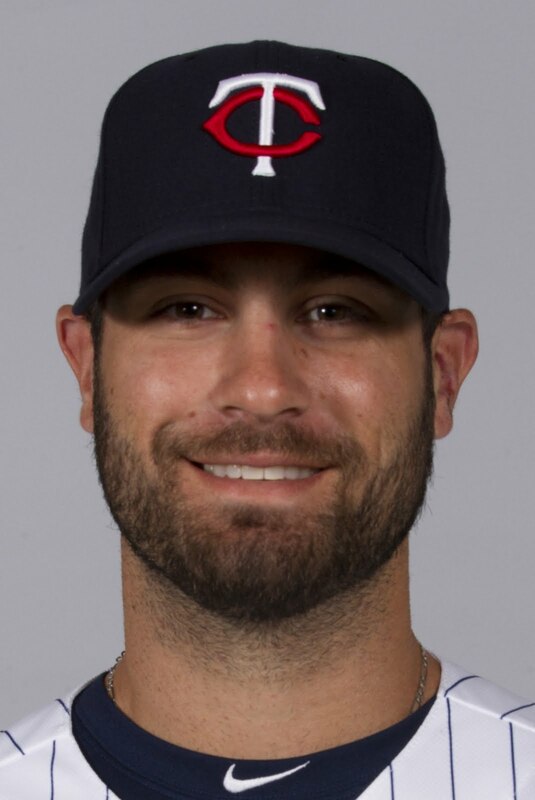 Jamey Carroll, entering the second and final year of his Twins contract, is the one guy assured of a roster spot. The veteran, who turns 39 next month, hit .268/.343/.317 last season as he split time at second base (64 starts), shortstop (36 starts) and third base (30 starts). It's worth noting that Carroll's final numbers were boosted by a big September (.388 for the month) that was also the month in which he had the least playing time. Only once did Carroll play four days in a row in the final month. Pluses for Carroll: Versatile, reliable, and the one guy in the running with any track record of competency at the plate. Minuses: An almost complete lack of power (while the on-base percentage is quite acceptable for a middle infielder, the slugging percentage is not), and age takes its toll on everybody. He might wind up with the biggest share of the second base job, but I think the Twins would rather use him in a heavy-use reserve role. Brian Dozier was handed the shortstop job in midseason and didn't do much with it. As a hitter, he showed a little more power than Carroll and a lot less ability to avoid making outs. In the field, he was ... well, he was an improvement over the mess that was the 2011 shortstop crew, but he was the weakest regular shortstop in the division. Dozier illustrates what I see as one of Gardenhire's chronic weaknesses as manager: Although he's a former middle infielder himself, Gardenhire's track record at evaluating middle infielders, and particularly shortstops, appears to be wanting. Gardy essentially had to be forced to play Bartlett in 2006. Last year, it appeared that Gardy wanted Dozier from the start, and Terry Ryan and Co. were dubious. In May, Gardenhire got Dozier, and played him consistently until Ryan took him away in mid August. All summer, Gardy talked up Dozier, and all summer, Ryan provided a background murmur of discontent with the shortstop play. The plan for 2013 appears to be trying Dozier at second base. He has hit some in the minors, and there is precedence for the theory that shifting a player to a less-demanding defensive position can help him at the plate. Pluses for Dozier: The most potential in this group to hit. Minuses: Very little experience at second base, and he's probably already blown his shot at the shortstop job. He's probably the front-runner for second base, but if he has trouble turning the double play, or if his hitting is still the mess it was at the end of 2012, it's back to Rochester. Eduardo Escobar, acquired from the White Sox in the Francisco Liriano trade, is a largely unknown quantity. He spent much of 2012 as a utility infielder with the Sox and had just 14 at-bats with the Twins. Right-handed hitter, very popular in the Chicago clubhouse, just turned 24 this week (he's the youngest of this field of four serious contenders). By process of elimination, if nothing else, he should get a good look this spring. Pluses for Escobar: Reputed to have good defensive tools. Minuses: His minor-league record doesn't indicate that he'll hit. He could win the shortstop job; he might be the utility guy if Carroll winds up with the bulk of the second base job; he might go to Rochester to get some playing time. Pedro Florimon, picked up on waivers from Baltimore last winter and then outrighted to Double A, ended 2012 as the Minnesota shortstop. Turned 26 last month, a switch-hitter who struck out as often with the Twins as he got a hit (30 of each). He's a rangier shortstop than Dozier, but somewhat error-prone -- and he is, emphatically, no hitter. Pluses for Florimon: He can help the pitching staff in the field, and this staff (especially the rotation) needs the help. Minuses: He's got to hit better than .219/.272/.307. His minor league record as a hitter is weaker than Escobar's. He's probably the front runner for the shortstop job, but I doubt he can hold it. The other guys: Daniel Santana is on the 40-man roster, but he hasn't played above High-A yet. He's ticketed for Double A New Britain. Non-roster invitees James Beresford and Ray Olmedo are essentially roster filler for Rochester and/or New Britain. Ideally, Dozier takes control of the second base job and hits well enough to justify a slot at the top of the order, and one of Florimon or Escobar emerges as a reliable defense-first shortstop. It's possible that there are no right answers here for Gardenhire -- that neither Florimon nor Escobar can hit well enough to keep their gloves in the lineup, that Dozier really isn't destined to be a major league regular. But the Twins need to find out. Carroll may be the safest choice in the middle infield, but he's no long-term solution. In this regard, Gardenhire's lack of job security may get in the way of the longer term good of the organization. kept out of the Hall of Fame. What was increasingly expected in this year's Hall of Fame election became official Wednesday: The writers, faced with the most loaded ballot of my lifetime, failed to select anyone for induction. While it is foolish to ascribe one motive to 569 people, it is clear that the consensus of the BBWAA -- the Base Ball Writers Association of America -- is that the doors of the Hall must be barred to steroid users, and that since it is impossible to be sure who used, all players of the Selig Era must be rejected. The Hall of Fame, as a practical matter, needs inductions. And the role of the writers in providing the inductees can be, and probably should be, changed. We don't live in the 1930s -- when the Hall of Fame was created and the BBWAA's role established. Then, it would have been difficult to create a better, more knowledgeable pool of voters than the relative handful of men who covered a relative handful of teams -- and who were spending their working lives on that beat. Today -- well, that's simply not the case. Such serious baseball historians as Bill James and John Thorn have no vote, as they aren't BBWAA members, while the ignorant likes of Bob Sansevere and Jim Souhan do. It would be easy for the Hall to create a different means of selecting inductees -- easy and probably better for the institution. The Hall has fiddled constantly with the process of the veterans committee over the years because it hasn't worked perfectly. The Hall has continued to use the BBWAA because that group has worked; if the BBWAA isn't useful, it can be dropped. And the BBWAA, beyond the travesty of this year's vote, has been doing an increasingly sloppy job. Which is (a) what one would expect him to say and (b) not what he's likely to believe if, and when, the writers continue to starve the Hall of new living inductees. A few hours after my previous post went up, word came that Adam LaRoche -- one of the nine free agents tied to compensation draft picks -- had agreed to a two-year deal with the Washington Nationals. This hardly contradicts the post's point, that some of the players who got qualifying offers perhaps should have accepted them. LaRoche wound up remaining with his original team, but if the reports Tuesday are accurate, his new deal guarantees $24 million over the next two years, or $12 million a year. That's less on a per-year basis than he turned down when he rejected the qualifying offer. We can't be sure that he'd have done better over the long run had he taken the offer, but it's certainly plausible. LaRoche certainly got less than he was anticipating; he was seeking a three-year deal, and that didn't come to fruition. But at least his original team was willing to re-sign him. That isn't the case for Rafael Soriano and, it appears, for Kyle Lohse or Michael Bourn either. A bit more than a week ago I pondered the whys of the apparent lack of a market for former Twins pitcher Kyle Lohse. Since then a St. Louis newspaper has reported that the free agent hasn't had an offer other than the "qualifying offer" made by the Cardinals to insure a draft pick in compensation for Lohse's departure. Lohse isn't the only free agent to find his market dried up by the new rule. Others in the same sinking boat are relief pitcher Rafael Soriano, first baseman Adam LaRoche and center fielder Michael Bourn. Nick Swisher somehow managed to avoid their trapped-in-limbo state. Nine free agents got the one-year, $13.3 million qualifying offer, which saddled their free agency prospect with the draft pick (and, perhaps more important, bonus pool) penalty. All of them turned it down, figuring that they would get more money and more years in free agency. Two of them -- David Ortiz and Hiroki Kuroda -- re-upped with their old teams. Three others -- Josh Hamilton, B.J. Upton and Swisher -- landed deals with new teams despite the penalties. Upton signed with the Braves, who doubtless figured they would replace what they lost in the penalty with the payback for losing Bourn. Hamilton's talent was seen as worth the penalty. Swisher -- I don't know, in this context, what the Indians were thinking, although they "only" lose a second-round pick. This is the first offseason with the new free-agency rules. Previously the standard for getting draft pick compensation was lower -- it merely required the old team to offer salary arbitration, not offer the average of the top 100 salaries -- and there was no loss of draft pick bonus pool money. And the old, analytically inept classification system, which chronically overstated the value of middle relievers, was wiped away. The old system was bad for a certain group of lower tier free agents -- the Juan Cruzes of the world who were categorized as Class A free agents because of the flaws in the ranking system. That type of player is free and clear now; teams might be willing to offer a middle reliever arbitration, but not $13.3 million. This system is squeezing a higher level of player. This was to be expected -- any compensation system, no matter how defined, is bound to find some free agent on the margin. It did succeed in cutting the number of players who are tagged with compensation picks, which is something the players union is doubtless pleased with. It will be interesting to see if, in future years, some of the players who get a qualifying offer accept. (Such a move would apparently have gummed up the Yankees plans; they didn't Soriano or Swisher back, and have apparently told Soriano in recent days that they aren't interested in resigning him.) When 44 percent of the qualifying offer pool are teamless a week into the new year, it suggests that the players underestimated the value attached to the picks and the bonus pool. Perhaps next winter it will be some teams who get stung. The Twins 2013 spring training camp, as in 2008, will feature a three-way competition for the center field job. One significant difference between the two: This time there is a clear "end game," a candidate who figures to wind up with the job. The question is more when it happens than who. Darin Mastroianni is Jason Pridie, or at least a right-handed version of same. Pridie fell rather quickly out of contention for the job in 2008; he was seen as more suitable for a fourth outfielder role than as a regular. So far, Pridie hasn't accomplished that either. by Baseball America that winter. Mastroianni is very likely to be on the 2013 major league roster. There's a role for him as a bench player. But his chance of opening the season as the regular in center relies more on the unreadiness for the other two candidates than on his own skills. Joe Benson is Carlos Gomez -- right-handed hitters who struggle to translate their obvious athletic gifts to usable baseball skills. 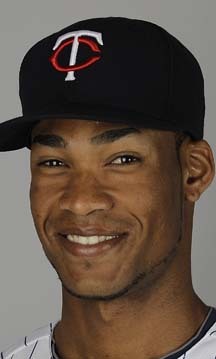 Gomez won the spring training competition in 2008 but ultimately lost the job to Denard Span. Gomez had the advantage of being the best shot at immediate payoff in the Johan Santana trade; Benson is in danger of falling out of relevance after a dismal 2012 in which he hit .179 in Triple A, .184 in Double A and had wrist surgery. Aaron Hicks parallels Span: First-round draft picks with notable plate discipline. Hicks is a switch-hitter but had, at least until last season, struggled as a left-handed hitter. Hicks as a better throwing arm than Span. Hicks has this advantage over the other two: He projects as a legitimate top-of-the-order hitter. Mastroianni is unlikely to hit well enough to be an everyday outfielder; Benson's on-base percentage is unlikely to ever be above average. I'll delve into this in more detail in a later benchmark post, but the Twins really need somebody in an up-the-middle position to hit in one of the two two lineup slots. But Hicks hasn't played a game above Double A, and his rise through the farm system has been a painstaking one. Hicks is the guy the Twins want to wind up with the job -- not just playing center field, but hitting leadoff. The question facing Ron Gardenhire and Co. this spring is: How soon can he handle it? Success in this area is, at the least, having Hicks secure in the centerfield/leadoff job by September. Joe Pepitone has been traded to the Cubs, and his new manager, Leo Durocher, knows him only by reputation. Durocher's been in the National League, Pepitone in the American. So when Pepi reports, Leo sits down with him and they discuss such topics what positions he can play (first base and outfield) and Pepi's abilities as a base runner. Pepitone assures Durocher that he can steal bases, and when Pepi gets a hit in his first game, Leo decides to test this claim. He has third base coach Peanuts Lowry give him the steal sign -- a wink. Pepitone doesn't go. Next pitch, Lowry winks again at the baserunner; again Pepitone ignores the steal sign. Third pitch, Lowry again winks at Pepitone, and this time Pepi responds: He blows Lowry a kiss. to see if he can sustain that success. The Twins went into spring training 2012 figuring that they had a solid, veteran starting rotation: Carl Pavano, Scott Baker, Francisco Liriano, Nick Blackburn, Jason Marquis. Each of those five had potential issues, but still ... they each had years of major league starting experience. The Twins had $30 million invested in those five, and got nothing out of it. It was never reasonable to expect that all five would come through. It was equally unreasonable to expect all five to fail miserably, but fail they did. The Twins wound up cycling 12 pitchers through the rotation (not counting Baker, who didn't make it out of spring training), each of whom made at least five starts and only one of whom performed well enough to be assured a 2013 slot. None of the spring training five remain on the 40-man roster; only Blackburn remains in the organization. Of the pitchers on the 40-man roster, the only man to throw 200 innings in a major league season is Mike Pelfrey, and he's coming off Tommy John surgery. The goal: Establish a bona fide major league rotation. The first two pieces are Scott Diamond and Vance Worley. Diamond was the one success story in the 2012 rotation tryouts; the lefty came up in May, threw strikes, got ground balls, and compiled a 3.54 ERA in 173 innings. He also had a low strikeout rate, which is not a good sign. Worley, acquired from Philadelphia in the Ben Revere deal, has had two decent partial seasons in the Phillies rotation; last year ended early for elbow surgery. (Diamond also had his elbow scoped this offseason). Mission: Keep them healthy and sustain their success. Diamond's not likely to get significantly better than he was in 2012, but if he can continue to be this extreme a ground ball pitcher he won't have to be. Worley's durability has yet to be established. They won't be aces, but they can be the third and fourth starters in a championship-caliber rotation. Beyond finding if those two can be 200-inning rotation anchors, the most important job is propect Kyle Gibson, in the process of rehabbing his reconstructed elbow. The one real benefit of signing low-ceiling veterans Kevin Correia and Pelfrey is that it eases the necessity to push Gibson into the rotation; there is also the corresponding risk that they'll unnecessarily block the higher-ceiling Gibson. The rest of the significant action in the rotation rebuilding project figures to come in the farm system -- trade acquisitions Alex Meyer and Trevor May, 2012 draftee J.O. Berrios, whoever the Twins take with the No. 4 pick in June's draft. Diamond and Worley aren't going to head the rotation of a championship club; that will take more powerful arms, and Meyer, May and Berrios have that kind of talent. The veterans who figure to be in the back of the 2013 rotation at least to start the year (Correia, Pelfrey, Blackburn, Rich Harden) and the survivors of the 2012 rotation shuffle (Cole De Vries, Sam Deduno, Liam Hendriks and others) aren't particularly good bets to emerge as usable pieces moving forward. If one does, that's a bonus. The ultimate goal, of course, is to see least one of the Meyer-Berrios-May trio graduate into front-of-the-rotation Cy Young contenders and to establish Gibson, Diamond and Worley as 30-plus start, 200 inning men. That's not a realistic set of expectations for 2013. For this year, success should be defined as establishing Diamond and Worley, as getting Gibson's major league career going successfully; as keeping the prospects on track — which is out of Ron Gardenhire's hands — and maybe find a useful back of the rotation guy in the stack of discards and rehab projects. his job? More wins would certainly help. The Minnesota Twins -- you might have heard this already -- have had two awful seasons the past two years, and the outlook for 2013 really isn't a whole lot better. Indeed, expectations of the coming season are lower than they were for 2011 -- when the Twins were coming off a 94-win season -- and 2012, when they could figure that better health from their stars and a veteran rotation would bring a rebound. They got the health, but the rotation completely imploded. Now manager Ron Gardenhire is working with an expiring contract, and there is an expectation that he's on his way out the door. The best moves of the offseason -- the trades of Denard Span and Ben Revere for Vance Worley, Alex Meyer and Trevor May -- are more for 2014 and beyond than for 2013. To be sure, Terry Ryan has suggested that Gardenhire's fate isn't tied to a specific won-loss record in 2013. But the general manager's been vague about what has to happen in 2013 for Gardy to keep his job. In the coming days, with some interruptions, I plan to examine six specific issues -- problems that the organization in general and Gardenhire in particular must address if the team is to return to contention. I would say this going into the series: If all these issues are fixed all season, the Twins will contend. I don't think that's likely, or even possible. But progress is certainly possible -- and necessary. Success and failure in any or all of these certainly cannot fairly be credited to or charged against Gardenhire alone, but in many of them he's going to have the final say in how they're approached. And I think that they will form a fair basis for evaluating how he's faring in his job in 2013.. The Twins, free agency and "the winner's curse"
I'm (slowly) reading "The Signal and the Noise," Nate Silver's book on predicting. Silver first made his reputation in the field of sabermetrics before garnering greater attention for his analysis of political polling, and the book has a chapter on predicting the future performance of baseball players ... but that's not where this bit on "the winner's curse" is contained. A basic econ class, and the instructor appears at the front of the lecture hall with a jar of pennies. The students are invited to bid on the jar. Some of the students will bid well under the amount of money contained in the jar; some will come close to the real worth -- but the one who actually gets the jar will always have bid more than he gets back. This is the "winners curse," and it applies to auctions, whether of a work of art, a free agent pitcher or a jar of coins. The winning bid almost always overpays. And, by extension, the bidders who come closest to discerning the true value don't get the prize. This is is why most big-ticket free agent contracts backfire on the signing team. This is the secret advantage of the tightly-budgeted operations, who don't make an offseason splash by signing somebody to an eight-year, $170 million contract that will be mightily regretted three years down the road. There are teams, to be sure, who operate financially in a manner that defies this basic economic rule. The Yankees. The Dodgers in the brief period (less than a year) since the new ownership took over. The Tigers, at least as long as Mike Illitch is desperate for a World Series parade. It would be foolish to deny that the wasted money brings a competitive advantage -- but that advantage is not a large as popularly believed, and the postseason field is seldom filled with the biggest payrolls. Which is why there is seldom wailing and gnashing of teeth in this corner when the Twins decline to outbid other teams for this pitcher or that. Free agency, particularly at the highest levels of spending, is a sucker's game -- and a lot more expensive than a jar of pennies. of poor hitting in the playoffs. The Cleveland Indians were about as bad as the Minnesota Twins last year -- 68-94 losses, two games ahead of Minnesota in the standings, but with stats that, at least according to Bill James' Pythagorean Theorum, should have put them two games behind the Twins. Their biggest move of this offseason has been a complex three-way trade (involving the Cincinnati Reds and Arizona Diamondbacks) highlighted for the Tribe by the loss outfielder Shin-Soo Choo and the acquisition of pitching prospect Trevor Bauer. 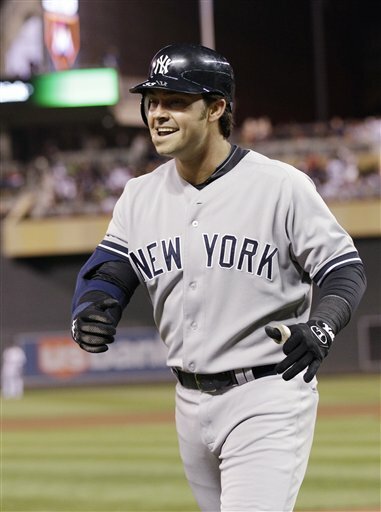 They then plugged Choo's spot by signing free-agent outfielder Nick Swisher. The trade itself is fascinating on several levels. Take Bauer, for example. He was the third overall pick in the loaded 2011 draft. He made it to the majors last season (four starts, which didn't go well). And the D'backs have soured on him. Bauer, 'tis said, insists on following his own training regimen and on calling his own game. Horrors. Now, I'm not someone who has to deal with Bauer, and maybe he's an insubordinate jerk and impossible to get along with. He's also talented, and as the Twins can attest, true aces don't fall out of trees. I suspect that Bauer's adherence to long-toss and his ideas about what pitches to throw when are things the Diamondbacks would tolerate from a veteran but not a minor-leaguer, even one with his collegiate accomplishments. Picking up Bauer has a good chance to be a real plus for the Indians. Then there's Cincy's plans for Choo. Choo, 30, has been a right fielder, and not a notably effective one defensively. But the Reds -- who also sent center fielder Drew Stubbs to Cleveland in the trade -- apparently have him ticketed for center. An outfield of Ryan Ludwick, Choo and Jay Bruce should be prolific at the plate, but it's not likely to do the Reds pitchers many favors. Swisher, who figures to fill Choo's spot in right (or could be installed at first base), may be testimony to what can happen when a corner outfielder is stretched out of his comfort zone. In his one season with the Chicago White Sox, Swisher played 70 games in center -- and had easily his worst season. Swisher and Choo are roughly equivalent players. Swisher is a couple years older and pricier -- Choo is still in his arbitration years -- so one would prefer Choo. But for the difference, the Indians have added a potential ace and a usable center fielder. New Year's Day is a conventional time to assess and adjust; there's something about a fresh set of numbers for the date that suggests that a fresh beginning -- and improvement -- is possible. So let's assess the blog. I put up 416 posts here in 2012, which sounds like a lot but is actually my fewest in a full calendar year since setting up shot in this corner of the Internet. I missed posting, I believe, on two calendar days, one of them Christmas and the other (if I recall correctly) on a travel day. I may not be good, but I am prolific. I've already this offseason made a few changes on the siderail. The rule of thumb here is that I regularly visit those sites; it irritates me when I click on sidelink on other blogs and find that the link is to a long inactive site. By and large, if I have a link to it, it's an active site that I actually use myself; if I don't use it, I'm not linking to it. But there are exceptions. I'm sticking with a couple of Free Press blogs that have gone dormant, if not moribund, just in case those colleagues reactivate their blogs. And I'm clinging to the hope that Carl Skanberg's cartoon blog will kick back in someday.